The MTV concert show Unplugged was at the apex of its popularity in the mid 1990s, drawing in some of the biggest names in music. Dylan's appearance introduced him to Generation X and proved to be his highest selling album in years. 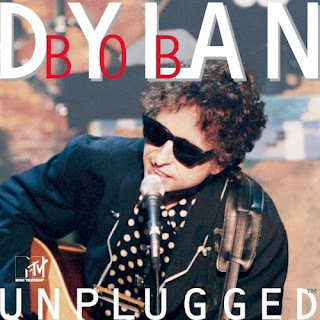 Originally Dylan planned to perform material from his two previous albums of folk music Good As I've Been to You and World Gone Wrong, but at the suggestion of the MTV producer decided to perform more of a "greatest hits" setlist, with a few rarities thrown in. With the The Never-ending Tour in full swing, Dylan and his band played an exuberant set of 12 songs ("Love Minus Zero/No Limit" was left off the CD). With Dylan donning a classic polka dot shirt he lead things off with a rollicking version of "Tombstone Blues." Then a soulful rendition of "Shooting Star" from his 1989 album Oh Mercy. Next Dylan played a more epic version of "All Along the Watchtower," one of the few examples of Dylan being upstaged in his career (by the 1968 cover version recorded by Jimi Hendrix). Dylan dove deeper into his catalog with "The Times They Are-A-Changin" from 1963, a modern arrangement that retains the power of the song. He even revived "John Brown," an anti-war composition from the 1960s that never appeared on an official album. "Rainy Day Women #12 & #35" remains an eternal crowd pleaser. A truncated version of "Desolation Row" is a highlight of the concert. Then a full version of "Dignity," an outtake from Oh Mercy. "Knockin" on Heaven's Door" sounds stately and heroic. "Like A Rolling Stone" gets a great arrangement in a soaring take on the 1965 classic. After a brief encore, Dylan ended the concert with another classic being kept alive for modern times, 'With God On Our Side." Despite the mixed reviews the official release received, the album sold well and got some airplay on MTV. Dylan appears relaxed and cheerful during the performance, proudly showcasing his band. There's a great version of "Tonight I'll Be Staying Here With You" performed at this show but left off the album. Still, worth it just to get an official Bob version of "John Brown." Thanks Rob! Definitely a great version of John Brown, I think it later appeared on the Witmark Demos.